February has been an interesting month. It was the month when I ditched my plans, to work on something completely different, and this was definitely a novel experience for me, because normally I am a very plan-your-work-and-work-your-plan kind of person. However, you know how it is when an idea takes root in your mind, especially about a project that has been on the back-burner for far too long (because you never found either the time or motivation to work on it) and then you just can’t stop thinking about it, exploring it further and working on it? 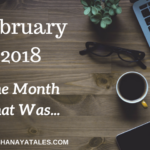 That’s what happened to me in Feb.
Actually I think it all started with the launch of my food blog, and me constantly tweaking stuff in the back-end of that blog, something that I hadn’t bothered to do on Shanaya Tales for a long, long time. In-fact ever since I started a full time job, Shanaya Tales has been on an auto pilot of sorts. And I wanted to change that (among many other things) so I started to do what I do best – make lists of everything that needs to be done, in hopes of completely restructuring the content & direction of Shanaya Tales. However to be completely honest, I have to admit that initially I did not correctly anticipate the scope of work. I actually thought that all I needed to do was change the theme, apply the one I bought for the food blog, and all voila, all the problems that were caused by the old theme on Shanaya Tales would be gone. But as it happens, the change of theme had the exact opposite effect. Things on the blog started breaking left, right and center, so to speak. From the font to the plugins to general display, everything was in disarray. And though there were several factors at play, it mostly boiled down to bad code caused by conflicting plugins that I had used in past as well as some custom coding that the blog designer had done in the Genesis framework. Which basically meant that before I could even touch my wish-list for the blog, I had to fix what’s broken. Which in this particular case involved me going back and fixing every single blog post manually (yes, you read that right) because there was just no other way (and trust me I tried my best to look for a short-cut). But anyway I guess in a way this was a good thing because this tedious, time consuming process (which is still a WIP) made me re-evaluate why I was doing this in the first place, and the direction I wanted to take the blog in the future. 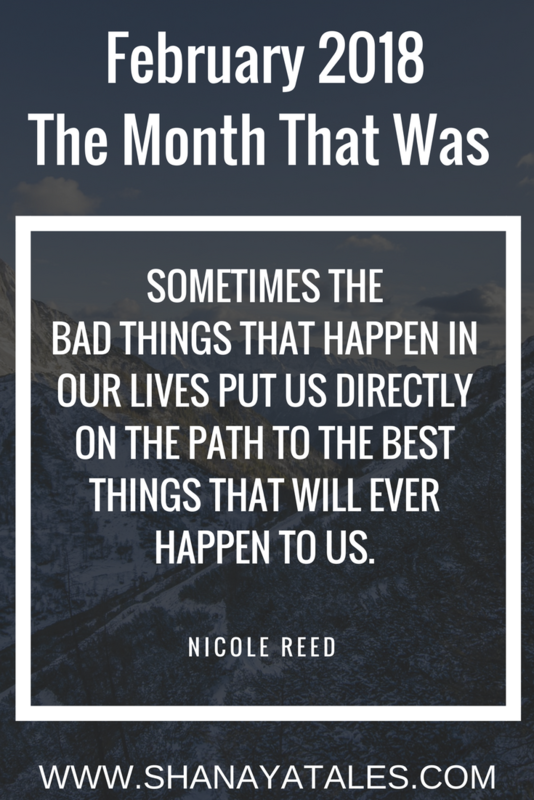 So you see, sometimes even bad stuff happens for the best, because when things come crashing down, you get the opportunity to build it back up and take it forward exactly the way you want to. So this was basically what I did for most of February. Which meant that even though there wasn’t much visible on the front-end, there was a lot of hustle behind the scenes. The other highlight of February (which is now continuing into March) has been that the construction of our basement began in the first week of the month. When we bought our house (which has 3 levels) only 2 levels were complete – the main level, and the top one, the basement was bought unfinished. So finishing that out was always on our radar, but we were trying to time it, balancing our other priorities for the house, and life in general. And finally towards the end of January everything fell into place to start work in February. It’s been kinda crazy trying to work through the constant distraction (more so for my husband who is more involved in supervising the project) and the decisions that have to made on a daily basis got overwhelming at times, but sometimes we’ve just got to do what we’ve got to do. And honestly the fact that we are able to get this done, and finished out the way we want to, is such a blessing that the minor annoyances don’t matter as much. And finally, I know this is something that I take for granted many times, but I guess once I started writing my monthly gratitude list, I simply could not ignore the fact that being able to work from home for my full time job has been a blessing that makes everything everything work as well as it does in my life (outside of enjoying good health & great relationships that is). Because it’s this luxury that makes it possible for me to juggle and balance work, blogging, cooking, and chores, while taking care of my son and being there for him on a daily basis. Yes, more often than not, on a day to day basis my life is a controlled chaos, but honestly without the option to work from home, it would have been just plain chaos. I have been making progress on the health & fitness front, I have finally gotten consistent with strength training, and have also started actively managing portions (something that has given me a lot of success in the past). Cardio is still a challenge, because of the cold weather and not being able to walk/run outside as much, but I’m working on at-home alternatives. The reading is going well too, after a great reading month in Jan, I was worried about hitting a wall in Feb, but nope, I managed to read 4 more books, and am still going strong in March, so all is looking amazing on that front. And finally – and this is something that I’m the most excited about – we finally finally booked our tickets for the much-awaited vacation to Disneyland and Harry Potter World in Florida. I cannot even tell you how much I am looking forward to this trip because I’ve planned it since what seems like forever now. I’ll definitely click a lot of pictures and share the experience, if you all are interested. That’s all from my end folks, I would love to hear from you. How was your February? What was your biggest accomplishment? What do you look forward to in March? Can I just say you’re a Rockstar? I adore your commitment to a job and that you put everything into fixing the bugs and coming back strong. So yay! Do share pictures from the basement! I want to see! Thank you so much, Shy. I am beyond excited for this upcoming vacation, because for one it’s been a LONG time since we last took a vacation, and more importantly, it’s Harry Potter. 😀 I will share pictures soon! I can imagine how much work goes into the backend for a blog. I know for I need that done too but have to outsource that. It’s so great that you can work from home. I wish I could have that luxury too. I hope you have a rocking March. Oh I tried to outsource it too, but the specific issues we ran into couldn’t be outsourced. Once I fix those, I will be outsourcing the rest. It’s just a slow /frustrating process though, and I cannot wait for it to be over, and start afresh! Oh I so agree. Sometimes no news is great news. That is how my current month is panning out, slow & relatively uneventful, but I am kinda loving it. Wow, that sound like a lot to work on each post manually! I don’t have such patience. 😀 You are awesome, Shantala! Glad to know that your home is getting finished the way you want it. Fantastic! Work from home is a savior especially with kids. I’m glad that you are able to manage everything efficiently. I’m reading just one book per month which itself is a luxury as far as I’m concerned. You are doing so well, dear. Ah! Tell me about the back end work when you change a theme!! I am in the same boat. Have harassed so many tech friends and pored over 100s of tech sites for answers for some or the other error. But it has been a great learning experience. Great going on the reading front. My pace has slackened because of a million things! Sigh. Hope you are having a rocking March, Shantala!! Yeah I agree. It is quite the learning experience, but in my case, the process has been so tedious, that I almost have felt like giving up. But I know I will hate myself for doing it, so trying to reach the finish line, even if it takes me a million years to get there. Yay for the reading and the health bit! I’m sure the basement would turn out to look awesome, so share the pictures. Gratitude journals are heaven sent, aren’t they? They teach you to find happiness in the smaller things. Have a fabulous March, Shantala. Oh yes, they are truly a blessing. It’s been a rough couple of months, and yet these gratitude journals have kept me focused on finding the good, and as a result I have found so many great things in the same stressful months that it has completely changed my outlook. I hope you have a great month ahead, Soumya. I’m a bit envious of you working from home and extremely envious of the HP world trip! Good on you for continuing strength-training. I loathe cardio so I’m impressed you are persisting with it. Hope you have a wonderful March! Loads of effort, but surely you would reap the benefits of it all. I love the way you are so organised. I keep trying to have my gratitude post in place every month, but then it just doesnt happen at most times. Feb was a month where I tweaked up my blog after a long time, so sometimes such things are required but hey sure do take time. Wow, sounds like you have a lot of good things going on, Shantala! Excepting the blog website glitch. What a time consuming fix! I’ve been there and know how a whole day and night can fly by while I’m on my website admin. trouble shooting. UGH. That’s so exciting about your trip to Disney & Harry Potter world…yay. Definitely share here your pics and adventure. When do you leave? Now I know the how and why of your ultra busy February. So I’m a non-technical person and don’t understand ‘backend’ at all but tell me in layman’s terms of course, how does that impact your blog for a reader? Does it make the layout cleaner or the reading easier? Just trying to understand this whole thing. The basement project sounds interesting. A cosy little library in the basement is quite the perfect dream for me. That’s not likely to happen of course since I live in a ninth-floor flat! But do share pictures. I’ll enjoy it vicariously. 1. I changed my blog theme, and some of the older font plugins (that I have now removed) had started acting up – which meant on the same page there were multiple fonts, which made for a terrible reading experience, so I am cleaning that up. 2. While I am at it, I am also reevaluating current plugins (to avoid such a disaster in the future) to now have a cleaner back end, updating old wonky images, fixing seo issues, working on ensuring higher page speed, fixing email sign up box etc. This is Prabodhan Patil and I lead SEO team at Indigo Consulting based in Mumbai. We want to run guest blogging activities for one of our client. We want to post these articles on mom & parenting blogs like yours. Please, let us know; what will be price per article ? Also, let us know; if it would be included link as well pointing to client’s website and sharing on your social media platforms. For all business inquiries and possible collaborations – please email me on [email protected].